These tips mostly focus on the early and mid-game content, as I and other folks at Kotaku haven’t reached max level and experienced the end game. You can do this by playing the first game or, much more easily, reading the in-game dossiers that are unlocked at the start of the sequel. 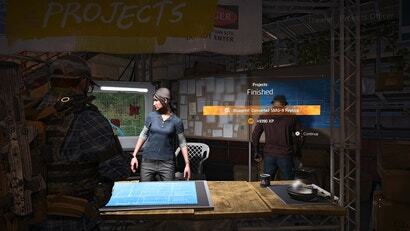 You can also catch snippets of back-story during The Division 2’s loading screens. Note that you can flip through three different types of tips and then cycle through the tips in that category. Pick “World” and then click through them. If even that’s too much, then, OK, we’ll just tell you: A scientist named Gordon Amherst created an extremely potent biological weapon, unleashed it on the population via tainted money on Black Friday, and chaos followed. The first Division focuses on how this led to New York City being placed on lockdown, while the US government activated sleeper agents amid the civilian population to help restore order. Those agents are called The Division, and you play as one of them. A Division agent named Aaron Keener goes rogue around the time of the first game and, as that game ends, he’s somewhere out there, armed with Amherst’s bio-weapon. 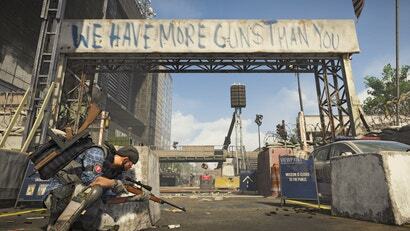 The Division 2 starts off several months later and we soon see that Washington DC has been ravaged as well. The Division is needed there, too. 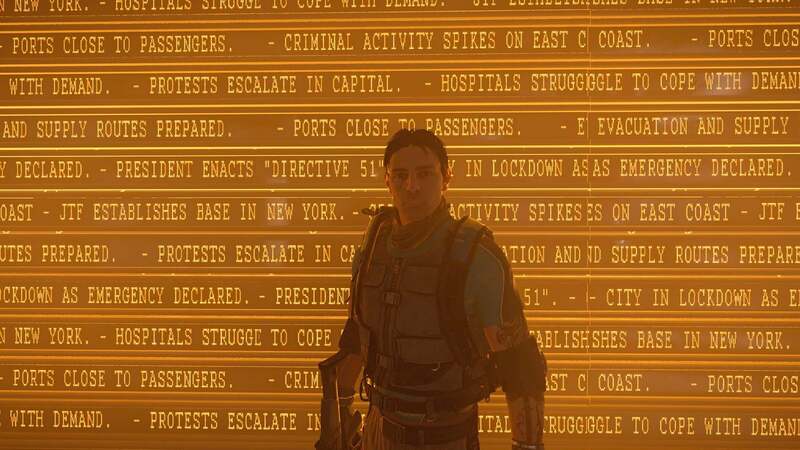 The Division 2 has a lot of different options to mess with, even before you start the game. You can change the size of text and have the game audibly read out text menus. Unfortunately, increasing the text size doesn’t change all the text in the game. 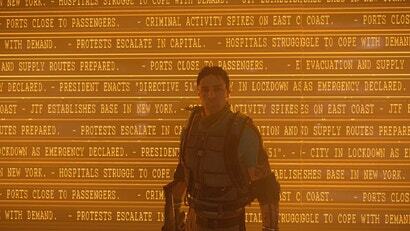 The size of words found on the map and in on-screen notifications can be really small. You might need to scoot your chair closer to the TV to read it properly. Use Cover, Listen To Enemies & Be Careful! 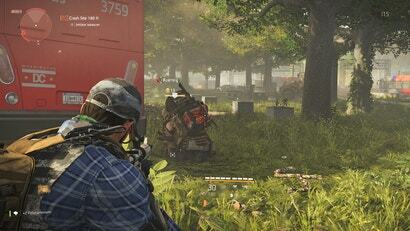 Using cover is very important in The Division 2. If you run around the open during firefights you will most likely get killed in a few seconds. Enemies are accurate and deadly. If you need to get out of cover, use the dodge move by tapping X twice on a PS4 controller or A twice on an Xbox one. This will make you harder to hit and can be useful to escape a bad situation or to gain ground on a lone enemy who is reloading or stunned. The AI enemies you fight in The Division 2 will charge, flank, hide from and ambush you constantly. They are pretty smart, and if you aren’t paying attention they can catch you off guard and drop you. Watch enemy movement closely, be prepared to fall back and, most importantly, listen to them. Enemies who run at you will often telegraph this beforehand with screaming and heavy footsteps. Other times enemies will shout out movements or positions. Use these audio cues to keep yourself alive in big shootouts. Many of your foes in DC will have weak points you can shoot to quickly kill them and even damage enemies near them. The Hyena chargers, for example, have bags they wear on their hip. Shoot these bags and their weird powder will explode on everyone nearby, causing mass confusion and stuns. Bigger enemies often have a weak point on their back. Even bosses can have these weak points. One time a powerful boss with a foam-launching weapon was giving me trouble. I hit his foam gun container and suddenly he was locked into place by his own fast-hardening foam, making him an easy target to pick off. It might be easy to forget, but you also can melee enemies. Just click in the right stick. This move is quick and can kill weaker enemies who you’ve already shot. There are also some challenges tied to using melee attacks to kill enemies. So punch some fools who get too close to you or your friends. During long fights, you will most likely take damage and your armour will get damaged or even totally destroyed. In these scenarios, you should fix your armour ASAP or you might die soon. But toward the end of a fight, when only a few enemies are left, you can save your armour and finish the fight instead. After every enemy is dead, the game will replenish your health and armour fully, saving you some armour plates. This is a mistake I made a lot in my first few hours. Your agent has some abilities, such as a turret or a shield, that can be really useful in a fight. These will vary based on how far you are into the game and what you have chosen, but regardless of what abilities you have, they are worthless if you don’t use them. Even if you feel like you have a fight totally under control, pop an ability to build up some muscle memory and to get more comfortable using these gadgets. 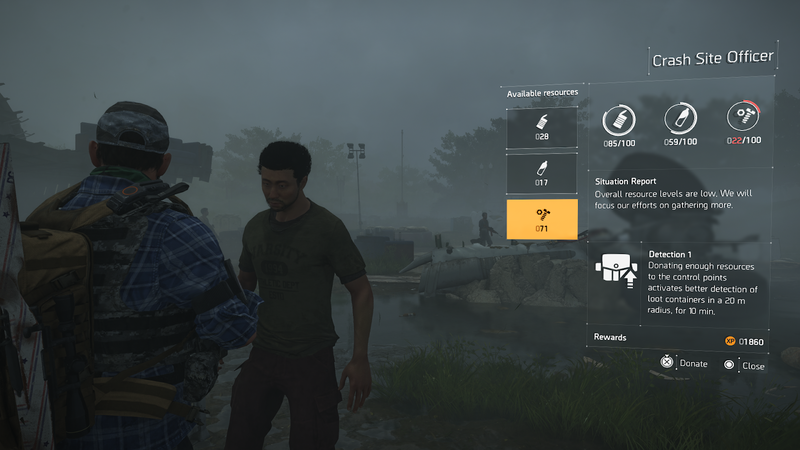 In The Division 2, you will find SHD Tech. These small boxes will unlock tokens that you can use to unlock and upgrade passive perks. I recommend first grabbing the perks that let you carry more grenades, crafting materials, supplies and most importantly armour plates. Also grab the perks that help you gain more XP. One perk that might sound strange or worthless is “Detection”. What this means is that after you give some supplies to a friendly control point, all lootable containers will be marked in the world and you can even see them through walls. This is really useful if you want to farm for crafting materials quickly or if you are trying to find all the water or food at a supply node. 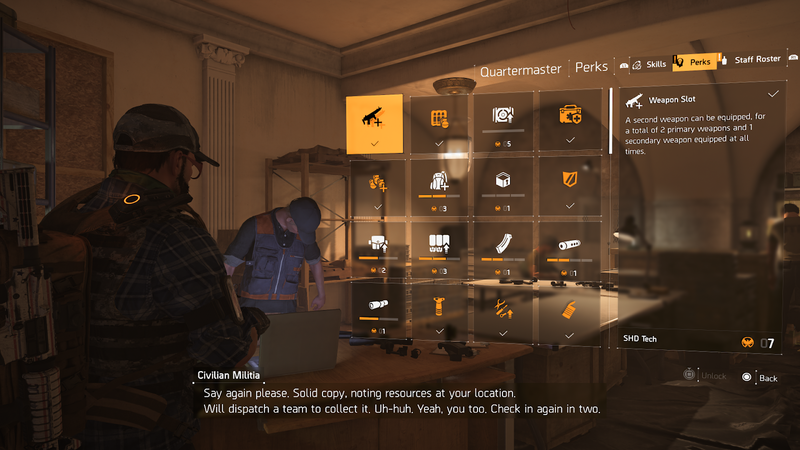 Like perks, some abilities in The Division 2 are better than others, depending on how you play. One of my favourite abilities from the original game, Pulse, returns in the sequel, but I would avoid getting it at least early on. Pulse is supposed to reveal enemy locations around you, but the range is so short it feels useless most of the time. Mods gained later in the game might improve it, but we’re not sure how far they go. For solo players, I highly recommend the turret, and I prefer its basic auto-turret version. This little thing does a surprising amount of damage and, even better, it can help you flank and pin enemies. You can toss your turret if you hold the ability button you assigned it to. If you are behind cover and tap the button, you will set it on the cover itself instead. The turret won’t fire until you fire or it is spotted, letting you set up a deadly ambush. I also like using the chem launcher, specifically the acid version. This can easily kill enemies hiding behind cover and chews away the armour on bigger targets. The Firefly is useful, but it takes a bit of practise to really make it work. Before throwing it, make sure the path is clear of any obstructions which are marked by a red X indicator. The Shield can also be powerful if paired with a strong sidearm or if you choose the variant that lets you use an SMG or assault rifle with it. Maybe you unlocked an ability or perk and it really isn’t all that helpful? Don’t worry. After spending a few hours in the game you will have earned enough tokens and unlocks to gain access to a lot of the other perks and abilities in the game. If you get a stinker, don’t beat yourself up. Just go grab some SHD tech and unlock a new perk. When you enter a new area, prioritise unlocking and activating the safehouse in the area. These function similarly to the safehouses in the original game, allowing you to spawn and matchmake with other agents. These safe houses also unlock new nearby objectives that, once completed, will unlock a boss fight and connected bounty. Completing this will reward you with a good chunk of XP and other goodies. Control Points Are Useful, Too! Control points work almost like the outposts found in recent Far Cry games. They are initially filled with enemies, but once you’ve taken control of them you can spawn there or fast-travel to them. These control points are useful for more than just spawning. You get a good amount of loot and XP for liberating them. Plus, these areas will spawn friendly computer-controlled allies who will patrol around the area, making it safer to travel in that part of the map. Each control point has a commander who you can give food, water and components too. 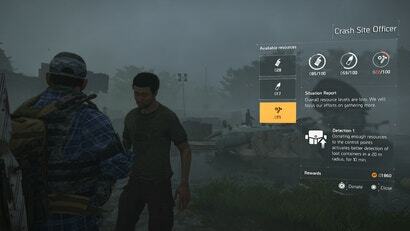 Doing so will award you with some XP and, if you have the appropriate perk, you will get the bonus ability to see loot containers in the world for 10 minutes. While it might be tempting to just focus on missions, control points and random activities, you should also take some time to just explore the world. Players are reporting secret bosses and hidden missions dotted around the map. Beyond that, the map is filled with loot containers and collectables. These will give you more XP and items. During missions, you might find locked chests. You will need a faction key to unlock them. They can be found underground in small utility boxes that hang on the walls in different tunnels and sewers below DC. To find entrance points to the underground section of the world, look on the map for yellow arrows pointing down. These mark manhole covers or other entrances to the dirt sewers below. 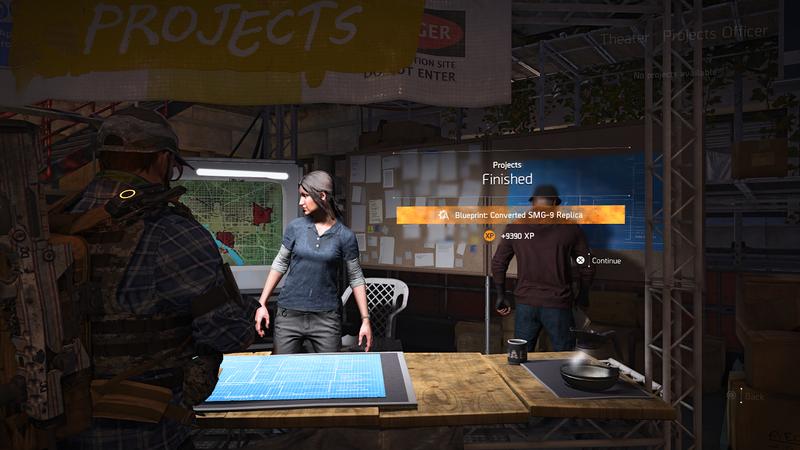 Settlements are one of the big new features in The Division 2, and they are a great way to earn XP and loot. These settlements can be improved over time by completing projects. These projects will not only visually change the settlement, such as adding more storage or solar panels, but they also award large amounts of XP and blueprints which can help you craft new weapons, mods and items. Another important tip: You can partially complete projects from the map screen. Sometimes you will need to donate certain items, such as a pair of gloves, to complete a project. You can do this anywhere on the map at any time by opening up the map and tabbing over to the left. There you will find all your current projects and their objectives, and you can donate any items in this section of the map screen too. Very useful! Projects are important. Getting them done quickly will help you level up faster and will unlock new blueprints sooner. A great way to quickly knock these projects out is to hold onto gloves, vests, knee-pads and holsters. Many projects at the first settlement will require some of this gear. So don’t sell those crappy gloves you found. Hold on to them and donate them to a project when they are needed. If they are taking up too much room, just pop some into your stash for later. You will be picking up new items and weapons a lot in The Division 2. Especially early on in the game. Make a habit of checking to see if you need to switch stuff out. Sure that rifle you are using is good, but you might have an even better weapon sitting in your inventory. You might even be able to improve them with mods you didn’t know you had. While in the inventory screen, you can sort items into a grid instead of the scrolling column. To make this change, click L3 on a PS4 controller or press down on the left stick on Xbox One to open a sub-menu and select the grid option. I find this makes it easier to see at a glance what I have and how good it might be. Weapon mods always have negative and positive attributes. Don’t just slap the first mod you find onto your favourite weapon. Instead, balance out what you want and what you are willing to sacrifice. For example, I have a great assault rifle that I attached a big magazine mod onto. This mod slows the reload speed, but I now have 61 rounds per mag. Some mods will give you more accuracy, but lower critical hit damage. Try to use mods that work for you and your play style. As you complete missions, finish projects and make progress through the game, you will gain access to mod blueprints. These can be crafted at the White House, your base of operations. Unlike in The Division, these mods only need to be crafted once, then you can use them on multiple weapons. 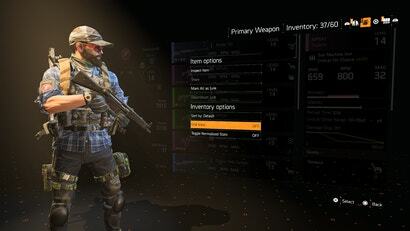 For example, if you craft a red dot sight, you can then add that to any weapon that is compatible with the sight and you won’t need to craft new sights for each gun. These are easy to miss. Hidden in the character menu, players can find challenges and commendations in the progression section. Commendations are a series of challenges that when completed award patches, which can be placed on your outfit. Uplay challenges are in the same menu and rotate each week. These will earn you some extra in-game credits, useful for crafting and buying items. On the main character menu, you can also open up Uplay. In here you can find some rewards that are free or cost some Uplay credits, that currency you earn by playing other Ubisoft games. These rewards aren’t incredible or game-changing, but they can help a new player starting out. Some of the rewards include crafting materials and credits. You can also get some weapon skins and patches. 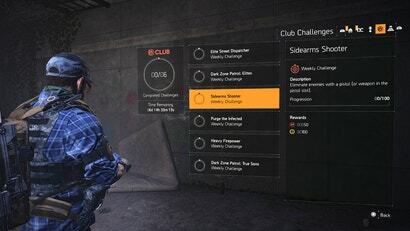 While the Dark Zone is a tense and fun part of The Division 2, for players just starting out it really isn’t worth it. You can find good or even better loot in the main world and through completing missions and projects. I recommend doing the tutorial missions for the Dark Zone and, for those curious, maybe exploring it a bit, but wait until you are a higher level to dive in. At level 24 you will unlock the ability to upgrade your crafting bench. Before manually upgrading it make sure to make all mods you have unlocked. The cost to make them increases with the crafting benches level. the hive revive version will auto revive you which can be handy for solo players.